A garden area has awakened at the south end of the Welcome Garden. 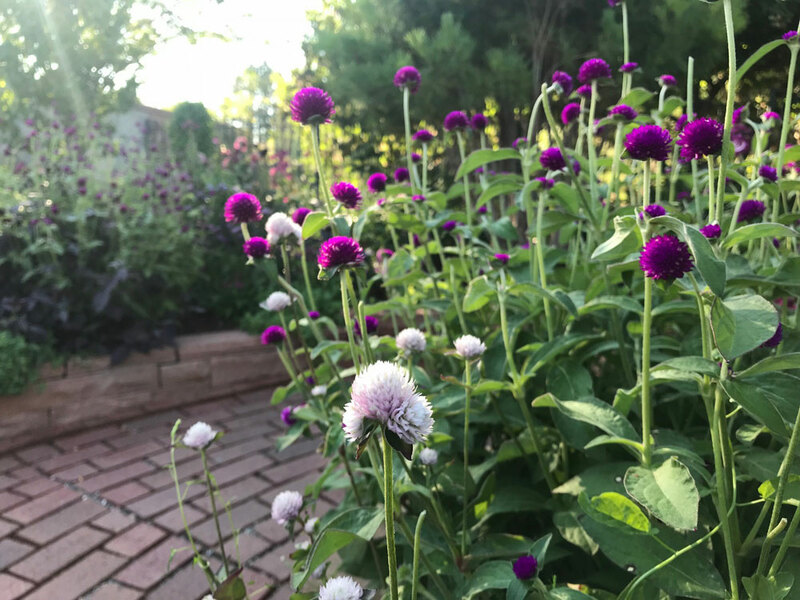 Stalks tipped in tiny purple pompoms lean into a new path, as if watching for their first visitors, while tendrils of vines consort to turn trellises into cone topiaries. Their quiet arrival, coming weeks after bricks were laid for the path, was fitting for a space that doesn’t want to make its presence terribly known. For this space is a secret garden – a garden that wants to whisper visitors inside, then cheerfully gather around them like fairies to a child. If you believe as I do that there’s a spirit to every place, this area has long felt like it wanted to be a secret garden. For years, it was part of a children’s garden, then in 2009, when the Welcome Garden was created, it was walled in on two sides and fenced in on another, giving it a secluded feel. A lack of public access into the area made it feel discreet and murmuring fountains in the Welcome Garden added serenity. 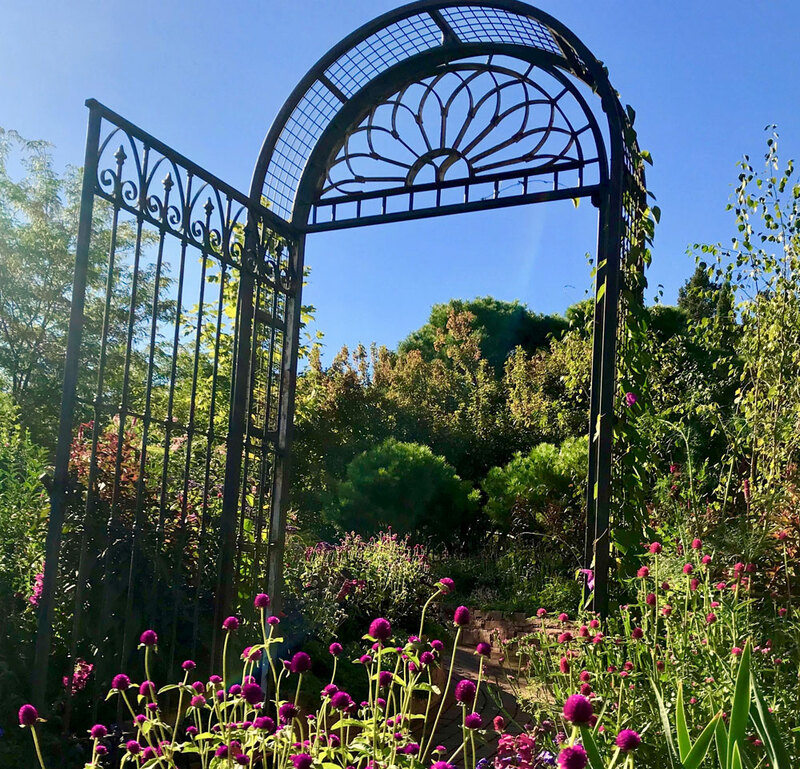 The area sat for almost 10 years – barely noticed, but by the horticulturists who tended it, much like a secret garden waiting to be discovered. An eclectic collection of plants was allowed to romp around and weeds tried to stake their claim. Then last fall, I put pencils to work sketching a design and by winter, a proposal was born. But a secret garden next to a group gate and near a visitor center? How can a garden feel secluded in such a busy place? That’s where a few key design elements come in, a bit of patience as plants mature and a willingness to imagine such a thing can be true. Though it may be hard to think of this space as tucked away just yet, try to imagine it as it longs to be. This spring we began navigating a path from hoping the garden can be done to seeing it done. 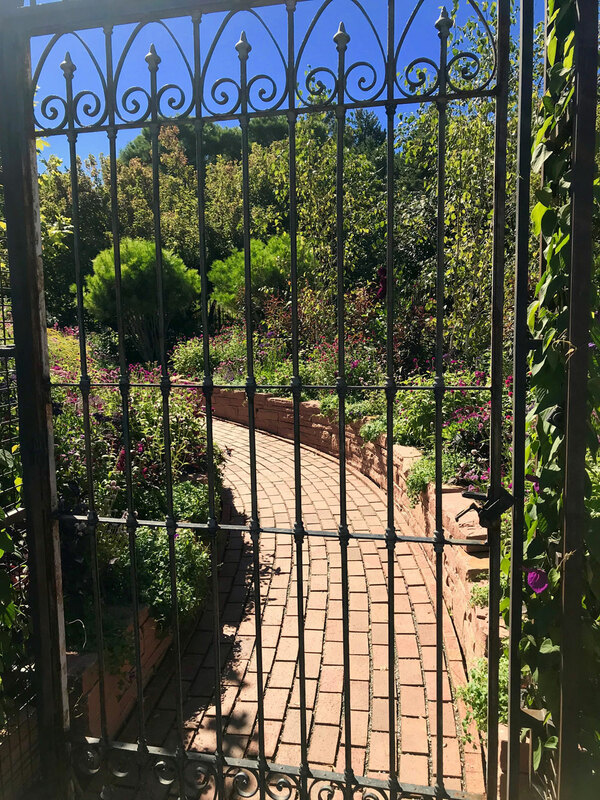 Thanks to a generous gift from The Ladd Family, we completed the first phase of the garden: a wrought iron gateway, a privet hedge, a sunken brick path and stone wall, and trees to fill in the woods of the space. In addition, beds were dressed in a tapestry of purple and pink annuals for their debut. 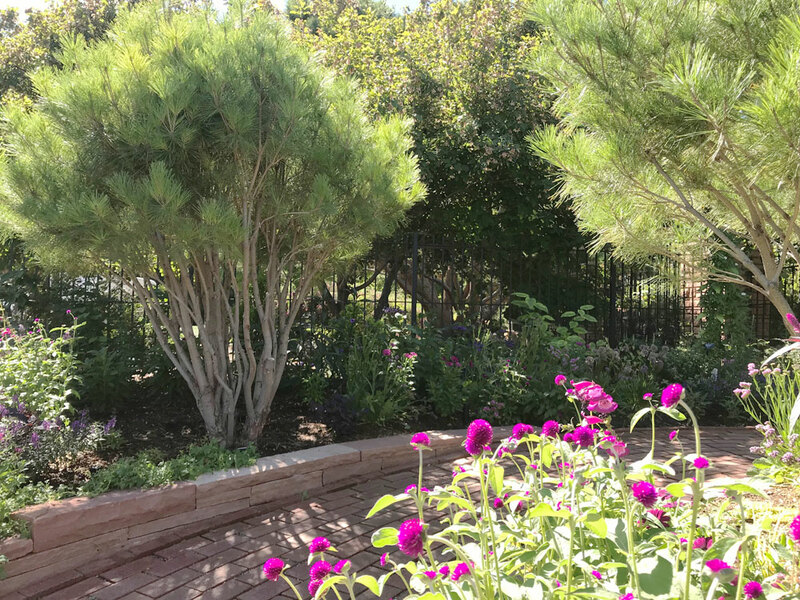 Each of these elements has helped anchor the space, separate it from the wide-open design of the rest of the Welcome Garden and create an air of quiet and repose. The entrance, welded from antique window covers by Roadrunner Fabricators, gives away the theme of the place the moment patrons step out of the Visitor Center. Aged and exaggerated in size to convey a sense of the fantastical, it is the “hole in the wall” of the secret garden, beckoning visitors closer. In time, an arbor framing the gateway will be thick with vines and a privet hedge (Ligustrum vulgare ‘Cheyenne’), will become a living fence for the gate, furthering a sense of mystery, as well as concealment. 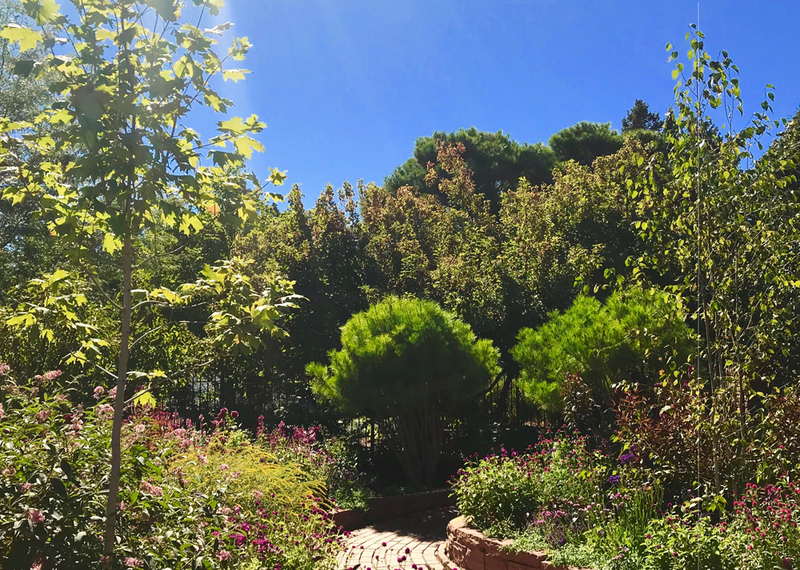 The path, laid by the Gardens’ master mason Robert Smith, meanders like a river, hiding views so that they can then unfold and providing another path into the heart of the Gardens. Bricks are placed lengthwise to draw visitors along and the path is partly sunken to allow wheelchair access and raise the height of beds on either side. As time goes on, something will be in blossom from the time winter goes away until it comes again, and vibrant bark and branch structures will keep the garden lively in between – and, if we are lucky, visitors will feel more and more of the abiding spirit of this space, a delicious sense of retreat and enchantment.